Because you can’t talk about unicorns without talking about glitter. When I saw this shirt on my facebook wall as placed there by the awesome folks at BelieveMerch, I loved the design but didn’t get the reference because I’m sometimes very clueless about pop culture references. 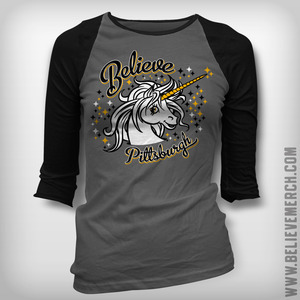 So I took to Google and entered in “Pittsburgh Unicorns” wondering if there might be some obscure semi-pro team in the city called the Pittsburgh Unicorns. Lacrosse maybe? Calvinball? Instead Google led me to this old page on the Pitt server last updated in 2006 and probably a student project: Pittsburgh Unicorn Rides of Ford City, PA. I just had to share my Internet find with you. Of course the header image of the blog is glittertastic, because again, you can’t talk about unicorns without talking about glitter. Just like you can’t talk about the Dread Lord Zober without talking about shrieking succubi. Although unicorn blood is fabled to have mystical healing powers, Pittsbugrh (sic) Unicorn Rides is a cruelty-free unicorn ranch. Our unicorns are not only free-range, but they have the best unicorn veterinarian in the world, Jonas Shoecsdaburg, on call 24/7. When Hilary was younger, she thought that unicorns were just mythical animals. Something fake, like evolution. But now, in her ripe old age of nineteen, she realizes that unicorns are real. As an avid fan of the band the Unicorns, a wearer of unicorn charm bracelets, and the co-owner of the Pittsburgh Unicorn riding company, Hilary lives, breathes, and does not eat unicorns. We aim to to eliminate discrimination against “mythical” creatures. Just because unicorns have a horn does not make them any less of an animal, just like the way that you still choose to wear a fannypack after 1993 does not make you any less of a person. Here’s our friend, Mat, with one of our most popular and majestic unicorns, Flufferkins. The feedback page includes testimonials from Bill Cowher, Macauley Culkin, and a zombie. I hope they got an A just for the fannypack line alone. Also, if I had a unicorn, I would name it Snuffleberrylumpkins. Or Bob. I would name it Mr. Troublepants, Esq. This is AAAAAAAAAAAAAAmazing. Makes me wonder where Hilary and Andrew are now and what they’re doing. Breeding unis, no doubt. I would pay good money for an exact replica of that shirt. Also: as someone who wears a fanny pack on the daily (holds my phone, keys, and poop bags when I walk my dog) … I appreciate their acceptance. This world is oddly hostile against fanny pack-wearers. You can pick up an exact original replica of one of those shirts at my online store http://www.believemerch.com. I totally plagiarized your glitter and unicorns. Don’t sue me. We’re sisters. You can’t plagiarize that which was never mine. “Unicorns and glitter” is as old as dirt. It might even be in the Bible in your book of Libations. If you scroll down to the bottom of the Product Information page, you will see an awesome comic strip!! While I’m not a glitter or unicorn fan (sorry), I did love that Ziggy tee, so much so that I broke my vow to stop with impulse shopping only two days after I made it. Just ordered the incredibly cool Unicorn shirt together with that puck bunny shirt, which will look perfect under my blue Pens sweater. Ford City is 5 mi from my house. I love it! In fact my best friend lives in FC. I’m sure this was probably a Lenape computer lab assignment.